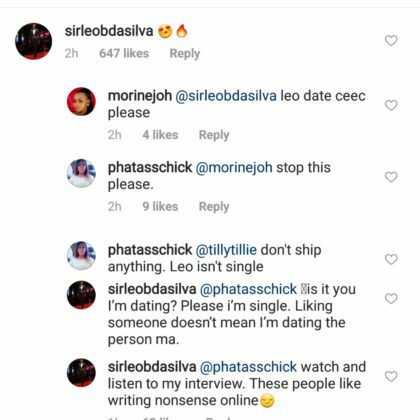 Former Big Brother Naija housemate Leo Dasilva has shut down a fan who said he could not date Cee-c because he is not single. This comes after a fan of Cee-C told another to stop asking Leo to date Cee-C because he isn’t single . Leo quickly shut her down, revealing he is single. Recall that, Leo revealed he had someone out of the house he would love to consider dating, From the look of things that didn’t work out. Moreover, even though Alex was close to him after his evicted he never showed any signs of dating her. Previous articleGhanaian actor, John Dumelo set to wed today!! !